Even today treadmill exercise for dogs is a relatively new concept for most. People stare in awe when they see us at trade shows and say “what a great idea!”. However, the long road to acceptance hasn’t been easy, it is an educational process where most people have to see it and use it to believe it. Once they do they wonder how they lived without it. As you see in the pictures we began promoting at trade shows in the early 1970’s and have been demonstrating our products ever since. 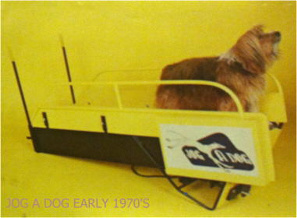 We have introduced thousands of dogs to the concept of treadmill exercise. It’s truly a labor of love fueled by an awesome product that has been delivering results for over forty (40) years! Believe it or not, there are many treadmills just like the models pictured here still in use today. 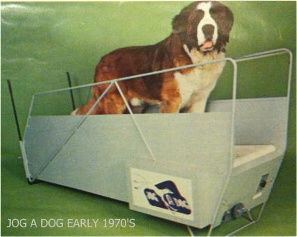 Every show we attend at least one customer describes their 1970's model JOG A DOG and how they are buying a new JOG A DOG as soon as their early model fails. Remember 1976 when everything red, white and blue was a must have? Check out our red, white and blue bicentennial model featured in the slide show on the left.